Talk about flavour bomb. Zesty umeboshi, smoky, spicy ghost pepper, and crispy tender chicken. Served on a brioche roll with sweet and sour slaw. Mix the buttermilk and tabasco. Lay the chicken tenders in the mixture for 24 hours, or at least 6 hours. Combine the Hellmann's® Creamy Ranch Dressing with the umeboshi paste and ghost pepper. Hold in the fridge until ready to use. Mix the Hellmann's® Real Mayonnaise and miso together and hold cold as well. Mix together the cabbage, daikon, cucumber, cilantro, and shiso. In a separate bowl combine the sugar, vinegar, lemon juice, and a pinch of salt. Mix together and hold until needed. When getting ready to make the dish, heat the oil in a stock pot or use a fryer. Mix the flour and Knorr® Chicken Broth Mix together in a bowl. Move the chicken tenders from the buttermilk to the flour, then repeat once more. Fry until golden (about 4-5 minutes). Transfer to wire rack while the rest are made. The tenders can be held in a warm oven. When ready to serve, slightly toast the brioche buns and spread with 1 tsp of the miso mayo on bottom bun. 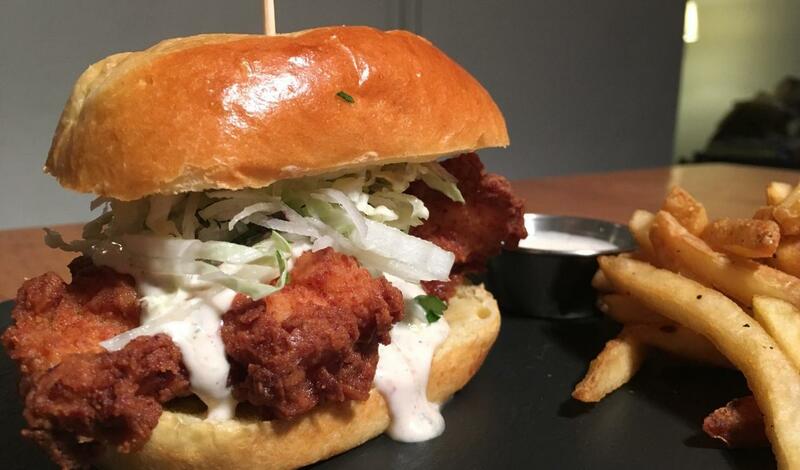 Lay the chicken tenders on the bun, top with 2 Tbsp of the Ranch sauce, and ½ cup of slaw. Top with bun and skewer. Serve with extra ranch and fries or tots.